There are many ways to recycle used glass bottles. A quick search of Pinterest locates creative candle holders, planters, mosaic tiles, and more. Glass can be cut, tumbled, painted, etched and melted. 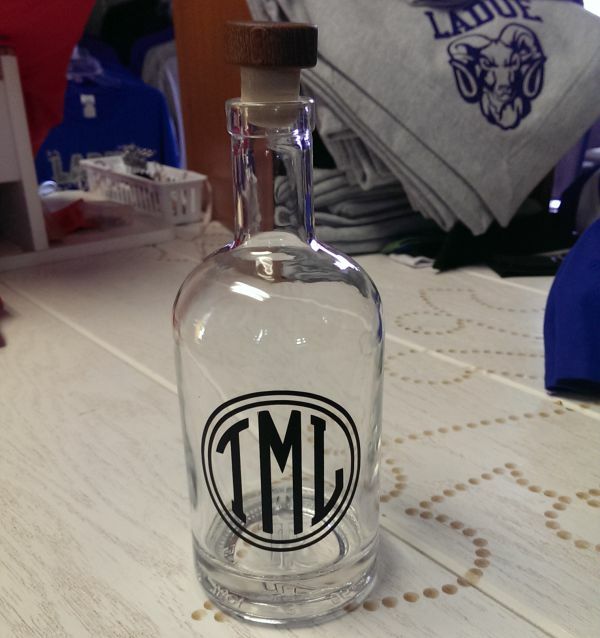 What I don't see much of is applying vinyl monograms, so that is what we will discussing. For our project we're going to recycle an empty whiskey bottle that has an interesting wooded cap. When the project is complete we'll have an attractive decanter worthy of displaying on anyone's bar. The first step will be to cut the vinyl using a professional vinyl cutter. When the cutting process is complete the portion of the vinyl that will not be used is weeded away. 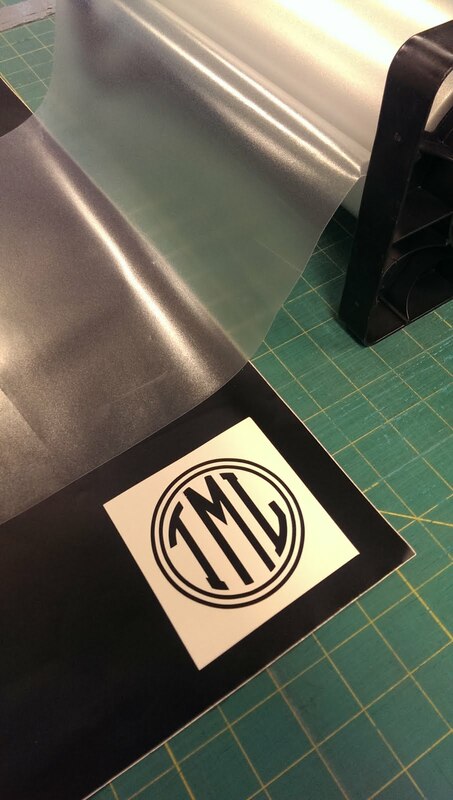 The vinyl monogram is then transferred to a clear carrier film. The transfer film is then taped to the bottle using blue painters tape. It's very important during this stage to be sure the monogram is aligned straight and centered. The alignment process is accomplished before removing the white paper backing. This allows multiple realignments without fear of ruining the vinyl print. Once the bare transfer vinyl touches the glass it will adhere quickly. 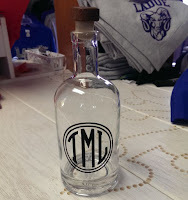 At that point if the monogram is not positioned correctly it will have to be removed and the vinyl piece re-cut. After the vinyl has been applied it is smoothed onto the glass to ensure the adhesive takes hold. 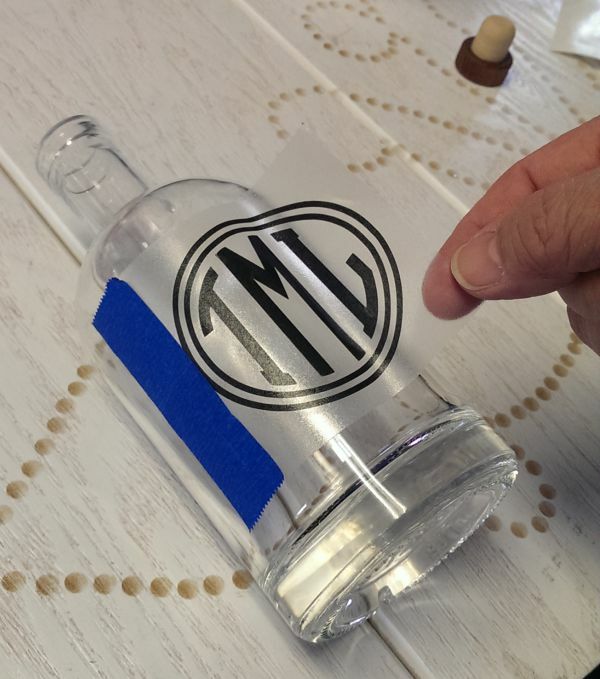 At that point the clear carrier film is removed leaving the vinyl monogram on the glass. 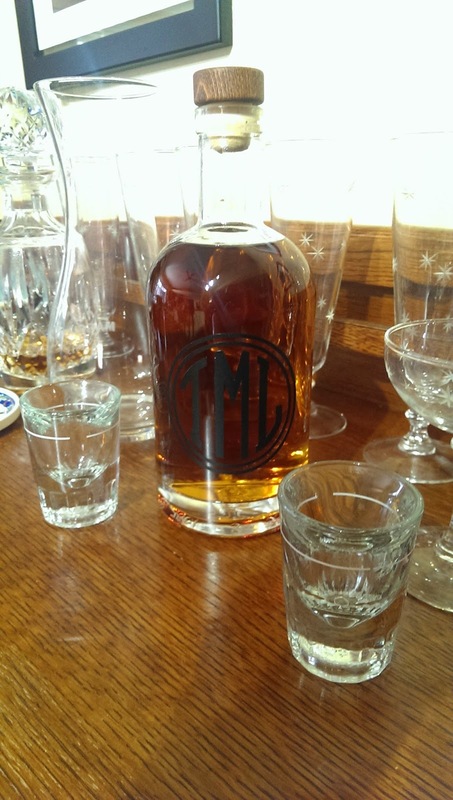 As you can see this monogrammed decanter fits in nicely with the other glassware with the appearance of a much more expensive gift than it actually cost. For those without vinyl cutters you can usually have a company provide the cut vinyl transfer for around $15 a sheet.